Now here's an adventurer that won't get any arrows to the knee. Floating Limbs describes a somewhat rare Lazy Artist trick for arms and legs (or lack thereof). Mainly, a character lacks anything visibly connecting their hands or their feet to the rest of their body. A subtrope of Invisible Anatomy, although the former can be excused due to conservation of detail, while in this trope the seemingly missing pieces are clearly missing. Combatants with these limbs may be capable of Detachment Combat and Rocket Punch. Grimace in this Pakistan Happy Meal commercial has no legs, and his feet are not attached to his body. They're just floating in front of him. hh, the mascot of hhgregg, has hands and feet which are in no way attached to his body. Nyorori the Snake in Juuni Senshi Bakuretsu Eto Ranger uses his psychic abilities to manipulate a pair of white gloves, giving him this appearance. The last and largest transformation stage of the Gurren Lagann in Tengen Toppa Gurren Lagann has body parts like this, as well as the Anti-Spiral's counterpart. Street signs indicating crosswalks and similar traffic features often show stick figures with no necks, just disembodied heads floating above their shoulders. This is particularly funny when the stick figure is riding a horse with a meticulously rendered mane. Fuzman and Acman Pictograms also have no necks, likely reminiscent of street signs and Olympic pictogram. The Love Glove from Doom Patrol has invisible arms and the power to use magic gloves. He was part of the second Brotherhood of Dada. The character of Dominus, who made his debut in the Superman story arc The Dominus Effect, appears as a humanoid wearing a cloak whose wrists and hands do not appear to have any arms attached to them. This also shows up with a few of the characters within the four realities themselves, clueing the reader into the fact that those characters are actually Dominus in disguise. The Hungarian Folktales animated series (at least the earlier episodes), had this as a running gag in the depiction of elderly kings as a bell shaped body and two floating hands. The only exception to this was King Mathias, who would make occasional appearances in a few episodes. Slipstar Runner, a character on The Homestar Runner Show, has hands and feet, but no arms or legs. The baby oysters from Alicein Wonderland. Wreck-It Ralph: Sour Bill, as well as a few other candy denizens of Sugar Rush, has neither arms nor legs but just floating feet and hands. Scuzzbopper from Twice Upon a Time. An early episode of Angel has a rare live-action example that was Played for Drama. The Monster of the Week is a Stalker with a Crush who had developed the power to detach and remotely control parts of his body, and uses them to torment his victim. Most of the characters in Klea's video to their song "Tic Toc" don't have necks, and their heads hover over their shoulders. LEGO microfigures — the tiny non-articulated game pieces used in the Lego Games series — are depicted as having (featureless ball) hands, but no arms, in comics about them. Rayman is the Trope Codifier and (former) Trope Namer for this. 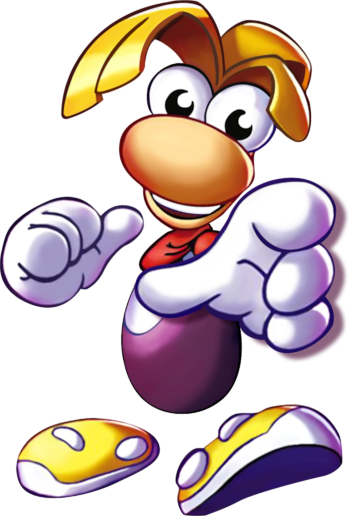 Word of God is that this was actually a space-saving shortcut; eliminating Rayman's arms freed up precious kilobytes that could be used elsewhere, making this a latter-day throwback to Mario's character design, which was also influenced by the hardware's capabilities. Also, it would be hard to throw his fists around like that if they were attached to his body.... Finally given an In-Universe explanation in Rayman Origins: When he was created by a bunch of fairies, they happened to lose a few parts in making him. Namely, his limbs. Globox's eyes and feet aren't attached to his body either. Dynamite Headdy has a detached head. His Distaff Counterpart, Heather, (Fingy in the Japanese version) has detached fingers/hands/whatever. Ni GHTS Into Dreams and its sequel, NiGHTS: Journey of Dreams applies this trope to its Big Bad, Wizeman the Wicked. Wizeman appears as a floating cloaked figure, but six disembodied hands with eyes on the palms float around him. The Thing Thing series follows this, but it's never pointed out within the story. Norstein Bekkler, the host of the Millennial Fair fun house in Chrono Trigger. As well as Queen Zeal's One-Winged Angel form, also an example of Cognizant Limbs. All the robots in Joy Mech Fight. The robots of Vectorman are all made up of floating orbs. The title character uses this to his advantage for his shapeshifting power. The title character of Plok, which actually came out 2 years before Rayman. Yoshi in Super Mario World 2: Yoshi's Island has floating legs. Though it's only shown whenever he's running, subverting this. Bowser in the original Super Mario Bros. game had invisible wrists due to NES limitations. They're supposed to be wristbands, but since his sprite, like all other 8-bit era game sprites, can only have up to three colors, what appears to be Bowser's wristbands are actually empty space. There are quite a few examples in the game Super Paper Mario, many NPCs lack legs and arms. Two notable ones are Dimentio and Count Bleck. Haunter. It IS a ghost. Also Porygon-Z, who's apparently glitched. Hoopa in both its Confined and Unbound mode has floating detached arms, though the Unbound form has six arms. Celesteela has a pair that also function as additional rockets. The Guard Armor boss from the first game has five separate parts: two legs, two floating arms, and a floating torso. All five parts are attackable, and in some tournament matches you'll actually fight against its disembodied extremities/torso. The prequel game gives it an Unversed counterpart, the Trinity Armor. The "Miis", people who can be made on any Nintendo system from Wii onwards, have no limbs in certain games or apps (such as Wii Sports or the StreetPass Mii Plaza), but, oddly, clearly do have arms in other games. In Wii Sports' baseball alone, the Miis constantly switch from merely being a head and torso, to having hands, legs, and feet. The character designer of Um Jammer Lammy gave Cathy Pillar, an anthropomorphic caterpillar, floating segments. Straw Critic Jasper's head generally appears to be attached to the body, right up against the suit's collar. However, there are some scenes where the head detaches from its normal position during his grandstanding (e.g. when you first meet him). In Jasper's case it seems to be a utility thing, like Rayman's limbs; since he never actually leaves his seat, (and may indeed be too fat to move — should we mention that his surname is Rolls?) his hands and head are responsible for all his body language, so for a guy as fat as he is, not having a neck allowed the animators to make him much more expressive. The dancer's in Milla's mindscape have limbs and necks that taper off to a point just short of actually connecting. The titular worms in the Worms series have Floating Arms since Worms 2, except in the intros of Worms 2 and World Party. I Wanna Be the Guy: The Kid's feet lack legs or ankles. Bongo Bongo, the boss of the Shadow Temple in The Legend of Zelda: Ocarina of Time. Dizzy has simple circles for hands and hemispheres for legs. Joka (renamed Joker in the Wii remake) in Klonoa: Door to Phantomile had no arms or legs. His appearance was modified in the remake, in which he is given thin arms and legs, but they disappear when he becomes a boss, with no reason given whatsoever. Certain Ys bosses, such as the Shrine boss, Dorman, and Jabir's final form in Ys V, and Galbalan in The Oath in Felghana, have Floating Giant Hands of Doom. In Wario Land 3, Rudy the Clown also has Floating Giant Hands of Doom, and you hurt him by stunning them and throwing them at his nose. Tonic Trouble, based on the same Game Engine as Rayman 2, had this. Coincidentally, the General even makes a cameo in Rayman 2. The mini-boss Jukid and the Plasma Wisp enemy in Kirby Super Star has these. The Japan-only Kirby's Super Star Stacker has Mr. Star and the bonus boss Gryll. As does Daroach in Squeak Squad, Magolor (in all of his forms) and Mr. Dooter in Kirby's Return to Dream Land. Taranza, the People of the Sky and Queen Sectonia in Kirby: Triple Deluxe also lack arms. So does Elline, Claycia and Dark Crafter in Kirby and the Rainbow Curse. Then there's Susie and President Haltmann from Kirby: Planet Robobot. They also lack arms. The three Mage Generals from Kirby Star Allies are the latest in the line-up of armless characters. Metroid Prime: Hunters has Trace, a Kriken Bounty Hunter whose head is completely separate from his body. Every humanoid player character in Legasista is designed like this in the overworld. Zero Beat, the robot/alien/whatever look-a-like of Beat from Jet Set Radio Future. It has strange floating rings as its arms, floating hands, and floating leg parts. In Berzerk, the gap between the humanoid's head and body is not part of a hitbox; a horizontal shot that goes through it is harmless. In the Live Powerful Pro Baseball and MLB Power Pros series, every character has detached feet. The hero of the Cute 'em Up Captain Tomaday throws Rocket Punches with Raymanian Four-Fingered Hands. The final phase of the Final Boss of Dragon Quest VI has his two hands act as separate enemies in the battle. In Nightmare in the Dark, the Final Boss has entirely detached hands in both of his forms. Wonder Boy III Monster Lair's sixth boss, Sunglar, has two pairs of floating hands, one of which remain stationary, the other of which periodically swat at the player as well as blocking their shots. The Final Boss of Lethal League, Doombox, has limbs that aren't attached to his body. Acroboxle's hands don't have any distinguishing features, fingers thumbs, so they switch places constantly. The creators are fully aware. Floating Hand Studios uses this for all of their X-Men flash cartoons. Zero Punctuation characters have spherical floating hands, which has caused problems with body language, and disconnected feet. Except for the imps, who have triangular pointy limbs, which don't seem to be very solidly connected themselves. This trope is "harshly" criticized in ZP's Rayman Origins review. The characters in Extra Credits have Raymanian Limbs with developed hands. When the main character talks from his podium though, he has full limbs. All the robots from Retropokon are this, as they're based on the robots from Joy Mech Fight. Some of the characters on Go!Animate are designed like this. The characters of Madness Combat don't have arms or legs, merely a barely modeled head (with a cross to represent where their face would be drawn on), a simple body and floating hands and feet. These characters, however, dress themselves up in ways that make them look very unique and recognizeable. Ito of A Moment of Peace is clearly the lovechild of the lizgreaper and Rayman. Kira of Breakpoint City has all her limbs... but no neck, much to the surprise of her would-be beheader. Brawl in the Family has a strip involving Miis playing Ping Pong, and they don't have arms in this case. Lampshaded when one Mii dismembers his arm with the ping pong ball. The Ask a Pony Blog Ask Piny Twilight stars creatures with no limbs between their hooves and body. The eponymous heroine of Redd has hands like this, but it's a Justified Trope in that she was born without arms and controls mechanical hands with some sort of anti-gravity technology with her thoughts. In Tails of Lanschilandia, Big Bad Kakralomino appears to have no legs (there's an empty space between his feet and the rest of his body), but has perfectly normal arms. In Blitzcrafter, certain scenes are rendered with predrawn sprites, which feature people's heads and limbs floating around a bean body. On the website Postopia (now Team Pebbles), there was a game called Big Mouth Life where you have a mouth for a pet. You could get new designs and clothing for them. The clothing included gloves and shoes, but they didn't any visible limbs or hands and feet for that matter. Fella, the mascot of DeviantArt. Every character in The Hive. In Invader Zim, GIR's legs are like this. The characters in the animated version of Mr. Bean do not have ankles, their legs and feet being totally separated from each other. VeggieTales, on the rare occasions that they're shown with any extremities at all. Justified in that they're produce. The Russian cartoon character Vinni Pukh has feet but no legs. In Schoolhouse Rock, Little Twelvetoes's whole body seems to be put together this way. His hat, arms, and torso are made up of white stripe-looking segments separated by empty space. His legs are connected to his pelvis, but he can move them out of contact with his feet. Also, he can stick his hands, head, and feet on any limb he pleases. Mala Mala Jong from Xiaolin Showdown, who is an evil demon warrior made entirely from Shen Gon Wu, specifically the Helmet of Jong, the Two-Ton Tunic, the Fist of Tebigon, the Third-Arm Sash, the Jetbootsu, and the Heart of Jong. Wally B. from the early Pixar Short The Adventures of Andre & Wally B. On Steven Universe, Peridot's fingers aren't actually connected to her arms, and can reconfigure to form a touchpad-like screen and even a fairly powerful blaster weapon. They also allow very elaborate ◊ gesticulations. They are, in fact, completely artificial components of her limb enhancers; her real fingers are quite normal. The Owl from The Owl & Co has no legs.